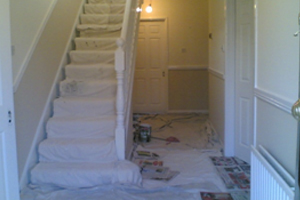 At M.C.Decorators we pride ourselves on our professionalism and cleanliness. Upon arrival on our first morning of the job we will put a plan together as to where best to start. We will consult with the client to insure minimum disruption. Next thing is to rearrange any furniture in the rooms or offices to allow access to the areas to be painted, mostly we prefer to do this ourselves as we can do it quicker and sometimes it can prove to difficult for some customers(heavy lifting and so on). Next is covering up, nothing is left to chance, every inch of the room and furniture is covered because decorating can be quite messy, we carry a huge range of dust sheets with us. If it is possible we will leave the dust sheets in place until the job is finished but this is not always the case, in some situations customers will need the room or rooms put back together each evening, this is no problem, all it takes is to give the place a good clean up and rearrange the furniture each evening before we go home. We also bring our own vacuum cleaner so you don't have to worry about your own being damaged. Every job is completed in accordance with the specification given in the estimate, in other words, if we state that Ceilings, Walls will get two coats of emulsion and Woodwork will get two coats of oil paint, they get at least two coats, if it means giving something an extra coat(at no extra cost) in order to leave a good job then that's what we'll do. 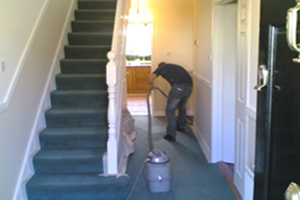 We offer a very pleasant, friendly and professional service and can guarantee total satisfaction to all our customers. Every job is given the same respect and attention to detail no matter what the size. So please don't hesitate to contact us today for a free estimate.